The album was ranked number 368 on Rolling Stone magazine's list of the 500 greatest albums of all time published in 2012. The single "Take It Easy" is part of the Rock and Roll Hall of Fame "500 Songs That Shaped Rock and Roll". This album was slated for Quadraphonic release and even given a Quadraphonic catalog number but it was never released in that format. 1. " Take It Easy"
1. "Train Leaves Here This Morning"
^ Johns, Glyn (November 13, 2014). "The Eagles, 1971". Sound Man: A Life Recording Hits with The Rolling Stones, The Who, Led Zeppelin, The Eagles, Eric Clapton, The Faces. Plume. ISBN 978-1-101-61465-5. ^ Michael Ray, ed. (December 1, 2012). Disco, Punk, New Wave, Heavy Metal, and More: Music in the 1970s and 1980s. Britannica Educational Publishing. p. 61. ISBN 978-1-61530-912-2. ^ a b "500 Greatest Albums: The Eagles – The Eagles | Rolling Stone Music | Lists". Rolling Stone. 2012. Retrieved January 22, 2016. ^ "Experience The Music: One Hit Wonders and The Songs That Shaped Rock and Roll". Rock and Roll Hall of Fame and Museum. Retrieved January 22, 2016. ^ Brown, George (June 1, 2004). Colorado Rocks! : A Half-century of Music in Colorado. Pruett Publishing Co. ISBN 978-0-87108-930-4. ^ Matt Sebastian (January 19, 2016). "Glenn Frey and the Eagles a storied part of Boulder's music history". Daily Camera. ^ a b History of the Eagles. 2013. Event occurs at 34:50–36:55. ^ Eliot, Marc (2004). To The Limit: The Untold Story of the Eagles. Da Capo Press. pp. 72–73. ISBN 978-0-306-81398-6. ^ a b c "Glyn Johns – Album by Album". Uncut.co.uk. Retrieved November 23, 2014. ^ a b Cameron Crowe (September 25, 1975). "Rolling Stone #196: The Eagles". The Uncool. ^ a b c d Eliot, Marc (2004). To The Limit: The Untold Story of the Eagles. Da Capo Press. pp. 74–75. ISBN 978-0-306-81398-6. ^ History of the Eagles. 2013. Event occurs at 37:15–39:00. ^ Eliot, Marc (2004). To The Limit: The Untold Story of the Eagles. Da Capo Press. p. 76. ISBN 978-0-306-81398-6. ^ Bill Halverson. "Unreleased Eagles Music". ^ History of the Eagles. 2013. Event occurs at 47:20–48:00. ^ The Eagles' Greatest Hit Grantland, August 14, 2013. ^ Ruhlmann, William. "Eagles". Allmusic. Retrieved September 10, 2013. ^ a b Christgau, Robert (1981). "Consumer Guide '70s: E". Christgau's Record Guide: Rock Albums of the Seventies. Ticknor & Fields. ISBN 089919026X. Retrieved February 24, 2019 – via robertchristgau.com. ^ Brackett, Nathan; Hoard, Christian David (2004). Eagles. Simon and Schuster. Retrieved September 10, 2013. ^ Scoppa, Bud (June 22, 1972). "The Eagles – The Eagles". Billboard. ^ William Ruhlmann (2011). "Eagles – Eagles | AllMusic". allmusic.com. Retrieved September 13, 2011. by Frey and Henley. ^ "Billboard 200". Billboard. June 24, 1972. ^ "Billboard 200". Billboard. August 5, 1972. ^ a b "American album certifications – Eagles – Eagles". Recording Industry Association of America. If necessary, click Advanced, then click Format, then select Album, then click SEARCH. ^ "Eagles – Eagles". Discogs. ^ "RPM Pop Music Playlist". RPM. 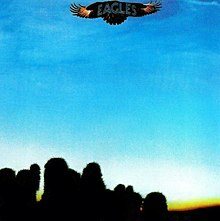 ^ "British album certifications – Eagles – Eagles". British Phonographic Industry. Select albums in the Format field. Select Silver in the Certification field. Type Eagles in the "Search BPI Awards" field and then press Enter.
" Best of My Love"
" One of These Nights"
" Take It to the Limit"
" New Kid in Town"
" Life in the Fast Lane"
" Please Come Home for Christmas"
" I Can't Tell You Why"
" Love Will Keep Us Alive"
" Hole in the World"